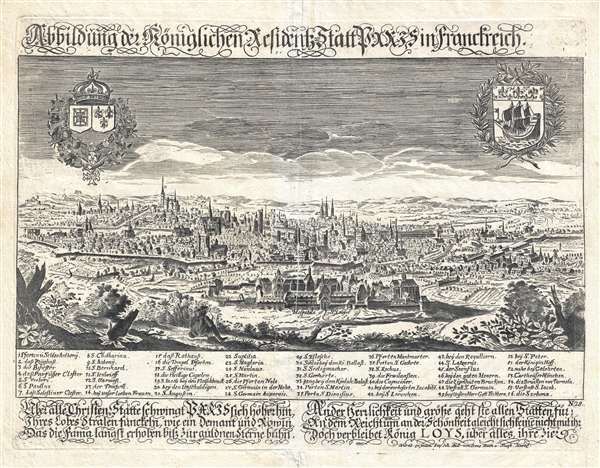 Only known example of a stunning 17th century German view of Paris. Abbildung de Königlichen Resident Statt Paris in Franchreich. An exceedingly rare c. 1650 German view of Paris, France, of which there are no other known examples. The view looks south to Pairs from a hilltop, possibly Belleville, to the north of the City. The Hospital of St. Louis (Louys) features prominently in the foreground. There are 56 named sites, including St. Severin, the Sorbonne, Notre Dame, St. Eustace, St. Germain, and others, associated with a numerical table at the base of the view. Two armorial crests decorate the sky above Paris, the Ship shield of Paris, and the arms of Louis XIV, with the Order of Saint-Michel garland. The publication history of this view is something of a mystery as it is of the utmost rarity with no other known examples. It appears to be in the style of similar town views issued by Paulus Fürst and Lucas Schnitzer around 1650. The prints were later reissued by David Funck, who acquired the Fürst/Schnitzer prints. At the bottom of the map, in the right-hand corner, there is an imprint referencing Johann Andreas von Creutz, a Nuremburg printer active in the late 17th and early 16th centuries. The Creutz imprint appears to overwrite some of the original map text, so we can assume it was added later, probably after Creutz acquired the Fürst/Schnitzer plates, possibly from Funck's heirs, around 1709. Based upon the Creutz imprint, it is reasonable to assume that the presently offered edition probably dates to around this period. Although this view was clearly bound into a book with similar views of other cities, we have not been able to isolate the title of that work. Lucas Schnitzer (c. 1600 – 1671) was German engraver, artist, and seal carver active in Nuremburg during the middle part of the 17th century. Schnitzer actively recorded the events of his time produced numerous engravings of the Thirty Years War. Schnitzer also issued religious engravings. In cartographic circles, he is known for 50 engraved views first published by Paulus Fürst, and later republished by David Funck and Johann Andreas von Creutz. While some of Schnitzer's views were modeled after those of Merian and Hogenberg, must are unique productions. Schnitzer also engraved for Johann Hoffman. He died in Nuremburg in 1671. Paul Fürst (1608 - September 11, 1666), a.k.a. Paulus Fürst, was a German publisher, printer and book dealer based in Nuremberg. His father was a weaver, and his mother Helena Susanna Schneling, the daughter of the Antorf art dealer Peter Schnelling, and granddaughter of art dealer Balthasar Caymox. He inherited his wife's grandfather's business in March of 1637, rebranding the company with his own name. First produced a large corpus of work ranging from heraldic books and copper engravings to flyers and broadsides. Despite his success, on September 11, 1666, Fürst committed suicide. His bookstore remained active after his death, until about 1704, under the name Paul Fürst Wittib und Erben. Johann Andreas von Creutz (June 17, 1689 – December 29, 1747), or Creuz, was a German bookseller and art dealer based in Nuremberg. In 1721 he bought property at Laufer Schlagturm 2, Nuremberg, Germany, where he set up shop as an engraver and printer. His business was sold by his widow, Maria Magdalena, in 1756. Nonetheless, the firm may have continued under his sons, as it was listed as late as 1765 as Johann Andreas von Creutzische Erben (heirs of Johann Andreas…). Very good, slight centerfold wear. Printing crease at center.